Over at the World Policy Institute, celebrated SF author Neal Stephenson has a great essay that's basically a call-to-arms to fiction writers to start collaborating with scientists. 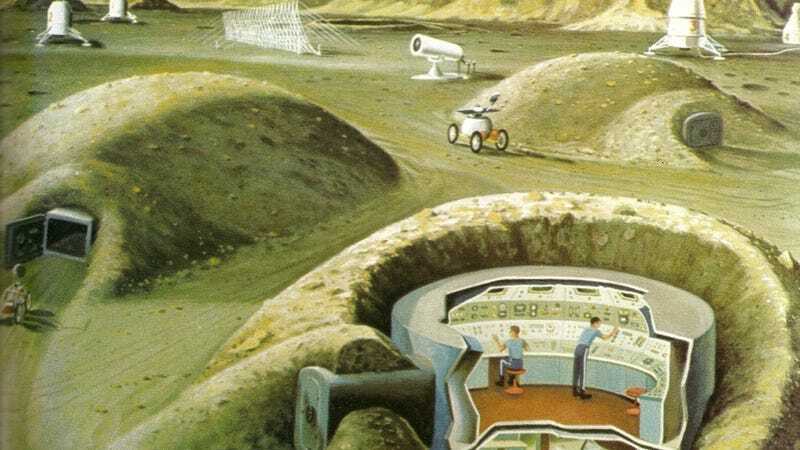 They can do this partly by writing more hopeful stories about the future — but more importantly, by writing stories about massive engineering projects, like Mars bases, that could conceivably be implemented. In other words, SF needs to stop mucking around with steampunk and dystopia, and start making decent roadmaps for a future where we all want to live. Though dystopian SF is a crucial part of the genre, Stephenson argues that it doesn't provide an imaginative framework to help scientists move forward with a larger vision of what their work might accomplish. Especially in an era when scientific work is so specialized and narrow, we need SF that tells stories of how each tiny discovery pushes us closer to a future where we escape the confines of our planet and explore the galaxy that awaits us. Stephenson says we need to move away from the idea that SF simply inspires new gadgets, and start thinking of SF as a narrative where science comes to have a larger meaning — a collective, human meaning beyond the lab. Good SF supplies a plausible, fully thought-out picture of an alternate reality in which some sort of compelling innovation has taken place. A good SF universe has a coherence and internal logic that makes sense to scientists and engineers. Examples include Isaac Asimov's robots, Robert Heinlein's rocket ships, and William Gibson's cyberspace. As Jim Karkanias of Microsoft Research puts it, such icons serve as hieroglyphs-simple, recognizable symbols on whose significance everyone agrees. Researchers and engineers have found themselves concentrating on more and more narrowly focused topics as science and technology have become more complex. A large technology company or lab might employ hundreds or thousands of persons, each of whom can address only a thin slice of the overall problem. Communication among them can become a mare's nest of email threads and Powerpoints. The fondness that many such people have for SF reflects, in part, the usefulness of an over-arching narrative that supplies them and their colleagues with a shared vision. Coordinating their efforts through a command-and-control management system is a little like trying to run a modern economy out of a Politburo. Letting them work toward an agreed-on goal is something more like a free and largely self-coordinated market of ideas. Stephenson has clearly tried to implement this notion into his own fiction; his novels are almost always massive tales involving many characters working toward a common goal or idea. His talent for showing the hidden connections between people is in full force in his latest novel, Reamde, which is a lesson in how collaboration between unlikely allies — Chinese virus writers, a Hungarian sysadmin working for the mafia, videogame developers, and an extremely brave geologist — can actually save the world. If you're a literary history buff, you might consider Stephenson's argument in the context of the great debate between Hungarian literary critic Georg Lukács and German expat Theodor Adorno in the early twentieth century. Both critics believed, like Stephenson, that literature had the power to give meaning to the world and inspire people to change their civilizations for the better. But Lukács felt that could be best accomplished via realistic novels showing all the social connections between disparate people. Adorno, who would probably have loved dystopian SF of the last 30 years if he'd lived to read it, argued for literary modernism, with its dark forays into human psychology and social dysfunction. But if you're just interested in how SF can help scientists improve our lot as a species, Stephenson's essay is well worth reading. He's particularly interested in fiction where "big stuff gets done" (BSGD) — and which reminds us that it's OK to fail while trying to do it. Failure is just one step in the process of doing big stuff. Obviously, moving our civilizations into space is a big theme for BSGD stories, but writers tackling big stuff have a wide field to cover. We need more SF about improving agriculture, inventing artificial wombs, preventing pandemics, repairing the educational system for children, and keeping our ice caps from melting. All of these are examples of big stuff that needs to be done. And science is helping in big and small ways with all of them. We await the stories that will unite us in a passionate quest to make them happen. Read more of Stephenson's essay over at the World Policy Institute.